Hi Dr Misner, greetings from a very warm Johannesburg! 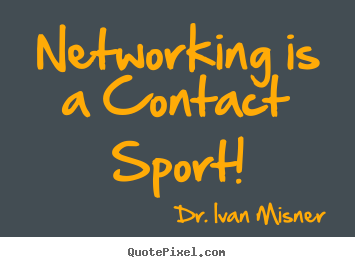 I’m part of the BNI BizMasters chapter and will be using “Networking is a Contact Sport” as part of tomorrow’s educational slot. This is great! Much of it seems like common sense, but the odd thing is that I still found myself learning a ton from the ideas and concepts mentioned. I loved your comment about networking is more similar to farming than it is to hunting. Planting seeds and cultivating longer-lasting relationships is way more effective than trying to pick off the fruit of a low-hanging tree branch, as it were. I also love how you talked about focusing on how you can support those in your network rather than focusing on what they can do for you. Thanks for sharing. I am a member of BNI Parkland in Spruce Grove, Alberta, Canada. I wanted to thank you for founding BNI as it was exactly what I was looking for and didn’t know already existed until a friend introduced me to it. I haven’t looked back since. Your Givers’ Gain philosophy really resonates with me because that is the general philosophy I try to live in my personal life and in my business. Thanks for being you!